SHARED ERRORS BIND BETTER THAN TRUTH (Or how faith feeds intellectual fascism of the tribal type). Aside from loving those who loved me, my life has been centered on a search for the ultimate nature of reality. That included history, to find out the errors one makes, and psychology, to find where those errors came from. I found out about Quantum theory. It entangled what is going on in the small with new, mysterious notions. I expected thorough dedication to truth among serious thinkers. And who could be more detached than physicists? Yet, I became disturbed by the great gap between how certain some scientists were that their theories were right, and the evidence they had. Sometimes it felt as if they had no evidence, or even the opposite, and as if error united men better than truth. How could that be? How come the tribal arose from the illogical, or even, from error? Was error a mean to tribalism? 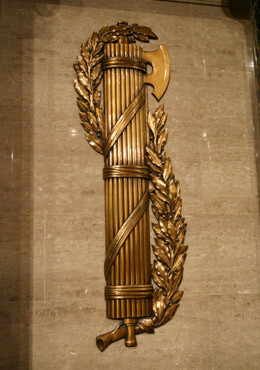 Verily, fasces were the fundamental symbol of the Roman republic, and from there on, the Franks and the French and American republics. Fascism is how weak social animals bind themselves together to make an irresistible mass. Fascism is how social animals drink and dine, without becoming dinner. It’s an old method, honed by hundreds of millions of years of evolution. Or why social animals exist. The power of fascism, like the axe surrounded by the fasces, can be used for good or for bad. In this essay, we will explore a related phenomenon, the POWER OF ERROR, and how intellectual fascism binds a tribe around an error rather than a truth, by making special brains. Instead of finding an example in politics or history, or the usual suspects (Jihadists! )I will exhibit an example from what ought to be the most intellectually rigorous subject. In the fundamental treaty on Quantum Mechanics by the great physicist Paul Dirac, a claim was made about the nature of reality that was not just poorly supported theoretically, but experimentally contradicted. Dirac had said that “photons interfere only with themselves”. Anybody with 2 lasers could check that was wrong. Yet, to this day, strong belief that this error does not matter persists. Why? I claim it stays a convenient cement that unites many mangy physicists. It’s not just because the photons-interfere-only-with-themselves makes for cheap thinking. It’s also because it provides with tribal, even mystical, and certainly neurological identification, precisely because it’s obviously false. Of course, for someone such as me, who puts the search for reality above tribal considerations, it’s most important to know if photons do, or do not, interfere with themselves. And as they do, it’s most important to find out how they do it. Quantum theory is subjacent to Elementary Particle Physics. The latter was uncovered by “high energy” experiments, in which particles collided into each other. Weirdly, though, all the obvious experiments to uncover Quantum theory had not been made! Somehow, particle theorists had persuaded themselves that Quantum theory was fully known and consistent. Yet, evidence that Quantum theory was not as understood as possible were abundant (the list was long of fundamental experiments that had not even been tried: Bohm-Aharanov, 1958; one photon-at a time 2-slit, independent lasers 2-slits; numerous EPR style, interaction-at-a-distance experiments, Popper experiment… tried for the first time in 1999, 65 years after it was proposed; etc.). Fundamental physicists were in denial of this lack of thoroughness on their part. It was a major epistemological, even ethical breach. An obvious explanation was that governments were more interested to fund high energy physics than really fundamental search for reality. Clearly, high energy physics could lead to death rays, Star Wars, etc. And it did. U.S. Navy ships using combat lasers are being deployed on the battle field. Present proposed high energy accelerators are of obvious military interest (as they would muster tremendously energetic particle beams over very short distances). Physicists, after all, are primates, and they find interesting what gives them bananas. Yet, there was strong evidence that these supposedly arcane minds behaved more like tribal monkeys than inquiring minds. Could it be possible that error united them? As I would find later in life, nothing is more conducive to building an exploitative community of minds than an error, also known as a faith. A faith that those erroneous minds share. And the more outrageous the faith, the better. Recent studies have shown that it takes longer to lie than to tell the truth. The brain has to work harder. Although, well trained liars learn to reduce that delay. I believe that ideas correspond to brain structures. This idea about ideas has far ranging consequences, from the duplication of thinking by computers, to ethics, to imagination. Mental structures determined by truth and reality are going to be common to everybody (that’s what is called “common sense”). For the tribally minded, that presents a major drawback: if one shares the same mental structures with everybody, one cannot distinguish the group one wants to belong to. The only way to distinguish a group is by teaching brains all the same, but differently from all other brains. This way one creates a common architecture of the mind, not found in any other group. The best way to do this is by teaching an error. The principle of deliberately committing errors, so that people can be tribally, religiously, hatefully, or oligarchically, bound together, with their special brains, rules… That’s why racism is so popular! It rules, because it has not been recognized. If it comes on the radar of the Enlightenment, that will change. Don’t ask the tribal minded what errors they made, because therein their identity. They will become aggressive, as you start to poke around their brains. Instead reject errors from all and any part. That will hinder the formation of hateful or exploitative groups. This entry was posted on December 7, 2013 at 8:37 pm and is filed under Fascism, Neurology, Psychology, Republic, Tribalism. You can follow any responses to this entry through the RSS 2.0 feed. You can leave a response, or trackback from your own site. Lies may help bundle individuals towards a common world view. We may be back to the old “what is a lie” conundrum – remember the defensive neocon mantra, “GWB never lied”. A number of errors were honestly thought as true by their propagators. The people who have the tools to investigate and debunk on their own are very few in numbers. Most of us have to routinely rely on authority. All my training in science was about what was being believed in current scientific circles. I read about experiments, theories, assumptions, and generally assumed that by the time a belief made it to the classroom, it was, if not “truth”, at least valid. This is not a criticism. As a society, we have to rely on other, qualified individuals’ input. So we putter on like a medieval blind men’s procession, hand on the shoulder of the man in front, firmly assuming the guy in the vanguard has at least one good eye. Does it really matter? Arcane bits of science are much like theology, ignored by the masses at no great peril. Neanderthals knew fire burned, and how to light it; that is still enough for most of us, who could not tell a plasma from a shot of rye. Incidentally, the fascia analogy for strength through unity is much posterior to Rome. You well know that the fascia and ax were really a symbol of judicial power: the power to flog and behead, in the name of the republic, and enforced by the lictors. And that is as powerful a binding for society as lies. In Rome, nobody cared what you believed, but you better behave. Dear Dominique: you mean “anterior” to Rome? If so, I am unaware of it. Fasces were, as far as I know a Roman invention. One of the few genuine Roman inventions [although they were experts with cement, and used one vastly superior to the best we have today in the way of durability (see the Pantheon!!!!!!! ), water resistance, energy and ecological impacts]. The Roman Republic rested on a tough, nearly Draconian (lots of death penalties) implementation of the law. The Franks were much more lenient. The Roman Republic went down directly by the insidious beliefs gaining, as in the case of G W Bush, that plutocratic lies were the only reality worth knowing. This movement has not abated under Obama, by the way, far from it. Everybody finds normal that the brown boy and his wife go prostitute themselves among the hyper rich whites, to, OFFICIALLY, beg for more money. Obama used even to sleep in their beds (I was, to my knowledge, the only one to make fun of the analogy… Well, all right, not an analogy: Obama and his wife literally slept with the hyper rich). Rome went down after the old Republican elite was decapitated in the war against Hannibal, and plutocratic ideals were allowed to gain over the Republican ones. The description you make of scientific training is 100% correct. Actually to make a science career, one has to hook up with the right guy, belonging to the right tribe, and then be careful about what one says and does. I have met top mathematicians who were really worried about looking bad. BTW, I am curious about the field of your scientific training. Biology? No Patrice, I mean posterior. Romans did invente fascia as a symbol, but they meant fascia to convey the fear of punishment, not the goal of unity. AFAIK Ben Franklin and possibly some early Native Americans were the first on record pointing out how a fascium (mostly of arrows) was stronger than its components. I’m not sure which meaning the Fascists had in mind. I’d wager the punitive one. And so had the French Republic. Heraldics are kind of the psychoanalysis of nations. Accordingly, disturbing memories are wiped out and replaced with feel-good ones. For example, my teachers made much of the golden honeybees which were part of Napoleon’s arms; pointing out how the Empire meant to honor and encourage honest work. And completely forgetting that in heraldics, honeybees did not mean work, they meant immortality, Not for the man, but for his dynasty. To answer your personal query: I’m an agronomist by trade. In France an agronomist is not expected to make things grow, (S)he’s more of a jack-of-all trades, able to tackle new problems with a robust set of basics. Maths were the lynchpin, along with robust chemistry, physics, economics and of course biology. And I did indeed find it useful, not because specific parts of my training could be applied to my work (a rare and always welcome occurrence) but because learning (or understanding) a new field was always within reach when necessary. Hence my very catholic range of interests. btw the Romans mastered “cement” as did many before them, but their invention was “concrete”. The next big step was pre-stressed concrete, a French invention (no kidding: Eugene Freyssinet) which Germany put to good but highly secretive use in its rearmament effort in the early 30’s. Dear Dominique:The fasces lictoriae were inherited from the Etruscans, when they installed a subject kingdom in Rome. It seems extremely unlikely that the bundling together of sticks was not mean to symbolize the strength through unity, right from the start. The idea was probably invented independently in many places (as you point out). I don’t know too well what’s the difference between “cement” and “concrete”, but I know the Lawrence Berkeley Lab was very proud last year to have finally understood the secrets of Roman concrete. It should be used in the future, as it is so superior, especially in light of the fact its production necessitates much less CO2 (much less than half). A brand new book on how nuclear energy was invented does not even mention Irene Joliot-Curie (who theorized and discovered the Uranium based chain reaction, and taught it to Otto Hahn… who got the Nobel for it!) So it is in the USA: a ferocious anti-French propaganda, very effective. It’s not just that French are frogs, but, when they protest, they are determined to be trouble makers! Quick explanation re: cement & concrete. Concrete is a mixture of cement ( binder which requires heat to be made) with various sizes and types of aggregate, from sand to rocks. Nothing to it. Great use for nasty carbon and other heavy metals though, definitely captured for good this way. Dear Andrej: The Romans used a special type of volcanic ash, and special chemistry. Normal cement used nowadays requires to go above 1000 Celsius during fabrication, Roman cement only 550 Celsius. I should say the Roman seawater cement, and others, because the Romans used many cements, most of them we know nothing about. In the French Hautes Alpes, I saw people painstakingly recovering wild grape wine to reconstitute a 3,000 year old variety of grapes not grown for 1,000 years. So there is lots of old knowledge that has disappeared. A French company makes the world’s most sophisticated cements (they even build bridges in the USA). They put fibers in it, including steel. Makes for very long unsupported spans. The very high performance concretes are more expensive, though. Even I made that typical mistake – Romans probably added ash to concrete to use less cement… and the steel/carbon content in slag is what I’m claiming is being captured and encased. Sunday night. Romans cements are not obvious, as they have not been successfully duplicated yet. They are far more resistant than modern ones. Last year or so I was running in the French wilds, south of France, lost a single track, found an aqueduct, with a hard clay flat bottom, and ran on that for miles. It’s not even in the tourist guides. I was amazed by the architecture.